Sharks the world over are in deep trouble. Eilperin, who is a reporter at the Washington Post points out that within the last few decades, 99 percent of smooth hammerhead, dusky, and bull sharks have been wiped out, often caught on long lines intended for more valuable food species. Other species are faring little better: Tiger sharks and scalloped hammerheads are down by 97 percent; silky sharks by 90 Percent; white thresher sharks in the northwest Atlantic by 75 percent. Oceanic white tip sharks may once have been the most abundant large animal on earth. But since the 1950s their population in the Gulf of Mexico has declined by 99 percent. By exterminating 90 percent of the oceans top predators, Eilperin says, humans are conducting a massive, uncontrolled experiment on the oceans. The initial results from that experiment are frightening in part because bad news for top predators is great news for their prey. Off the United States East coast, the demise of sharks has resulted in a population explosion of cow nose rays. The bottom-feeding rays in turn have decimated scallop, oyster, and clam populations to the point where North Carolina had to close its once lucrative scallop fishery. The oceans are suddenly awash in explosions of jelly fish, which devour young food fish. Some scientists think the absence of sharks may be one explanation for out-of control jelly fish populations. 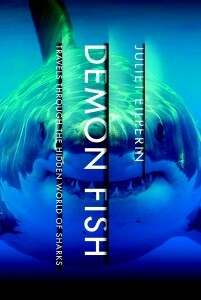 Demon Fish provides a multi-dimensional look at these creatures. They have been swimming in the world’s oceans for 400 million years (a good 200 million years before the first dinosaur lumbered onto the scene), but many species could well go extinct in our lifetime. Eilperin explores sharks’ role in the mythology of early human societies, dating back to when people first developed art. She travels the globe spending time with scientists who are working to understand these predators, and hangs out with “sport” fishermen whose goal is to catch as many as possible. 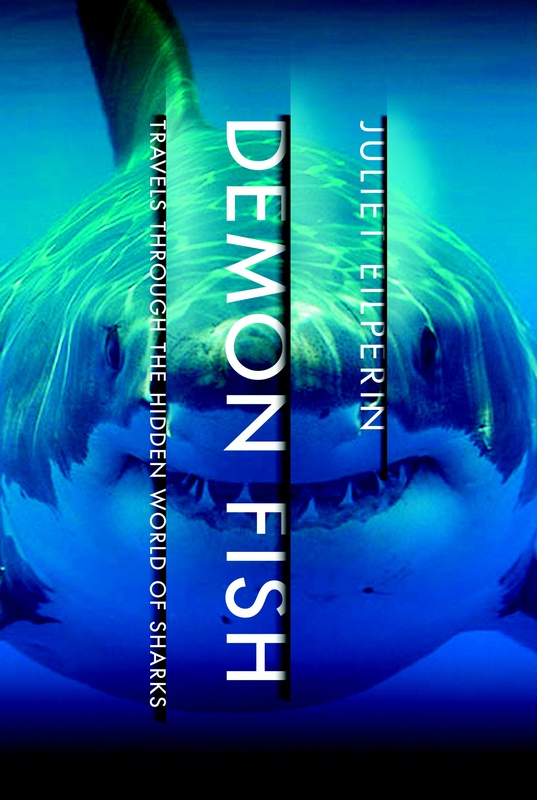 Read Demon Fish and you will understand the creatures we are wiping out and all the cultural, biological, scientific, and environmental ramifications that go with the unfolding tragedy. Of all the reasons for the decline in shark numbers, none is as inexplicable—at least to westerners—as the trade in shark fins for use in soup, primarily in Hong Kong and China. Some 73 million sharks, representing 30 to 40 different species, are killed each year for the fin trade. Often the fins are cut off and the shark thrown back in the water alive—for a short time. Fins can sell for as much as $880 per pound in Hong Kong, and a single fin from a basking shark (the world’s second largest fish) sold for $57,000 in Singapore in 2003. For what? According to Eilperin, shark fins have absolutely no culinary merit whatsoever, no flavor and no nutrition. All they do is add a little texture to what soup holding bits of shrimp and seafood in suspension. The fin component of her bowl was a “gelatinous string” about an inch long, a “translucent, tasteless bit of noodle” that, she says could be replaced by a plain rice noodle at a moment’s notice. But shark’s fin are valued in Asian communities around the world as a status symbol, and they are an essential ingredient at the wedding feast of any upwardly mobile couple—of which there are increasing millions as the Chinese economy grows. But Eilperin shows that we still have a chance to save sharks. Shark-watching ecotourism is becoming popular in parts of South Africa, Mexico, and the Caribbean, making the animals more valuable alive than dead. Marine sanctuaries have been established where no fish can be taken. And rigorous enforcement of existing laws, often by local fishermen, has been effective. But to succeed, she says, humans will have to curb our worst excesses. A tall order.